Nowadays, if someone hands you a bill with any number higher than $100 printed on it, you’ll instantly be skeptical. But not so long ago, high denomination bills were in public circulation. So how high did the bills go? $500, $1,000, or maybe even $5,000? In fact, as you’ll soon learn, it was much higher than that. Is there a $10,000 dollar bill? Yes, a $10,000 dollar bill does exist and it still is considered legal tender. It was the highest denomination US bill to be in public circulation. Can you imagine walking into a Walmart and paying for a stick of gum with a $10,000 dollar note? The chances of you stumbling upon a high denomination note like this are low. In fact, it’s been estimated that only 350 $10,000 dollar bills are still in circulation. And most of those are in the hands of museums or private collectors. In fact, if you do have a $10,000 dollar note in your possession than the last thing you’d want to do is to use it to buy groceries. The value of the bill is much greater than $10,000 because of its rarity. But before we talk about value, let’s learn a few things about the elusive $10,000 bill. Who is on the $10,000 dollar bill? The $10,000 dollar bill features the portrait of Salmon P. Chase. Don’t know who Salmon P. Chase was? Don’t feel bad, most people don’t. Salmon P. Chase was the Secretary of the Treasury to President Abraham Lincoln. That alone doesn’t make one worthy of adorning a $10,000 dollar bill though. Salmon Chase was in charge of the Treasury when the federal government introduced modern banknotes (greenbacks). In 1928 he was honored for the role he played, by having his face put on the shiny new $10,000 dollar bill. 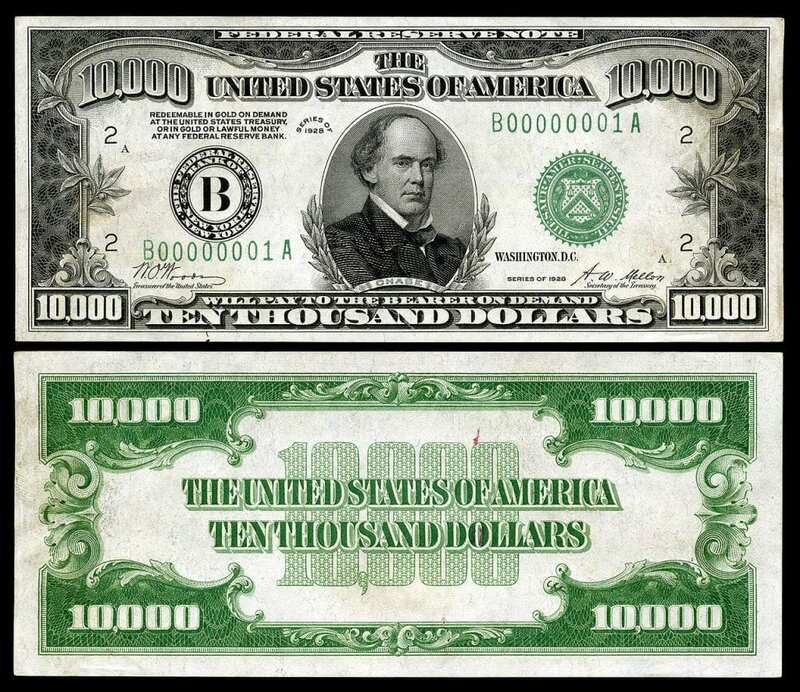 There are actually two different series of $10,000 dollar bills, but both have Salmon P. Chase face on the front of it. What’s a $10,000 dollar bill valued at today? Since the $10,000 dollar bill is so rare, it’s worth much more than $10,000. However, don’t take it to a bank. You’ll receive $10,000 in return. You want to take it to a collector. A $10,000 dollar bill in pristine (great) condition can be worth upwards of $140,000 to collectors. But even if your bill is in poor condition, it can still be worth around $30,000. So make sure you know the value of your rare bills before taking them to a bank. There are too many stories of people finding rare, old bills and turning them in for their face value. While they’re still legal tender, high-denomination bills like the $10,000 dollar bill were last printed in 1945. Then, in 1969 the Federal Reserve officially discontinued them due to “lack of use”. Yes, a $10,000 dollar bill exists and is still technically considered legal tender. It’s now worth much more than ten thousand dollars because of how rare the note is. A $10,000 dollar bill is worth upwards of $140,000 (pristine condition). 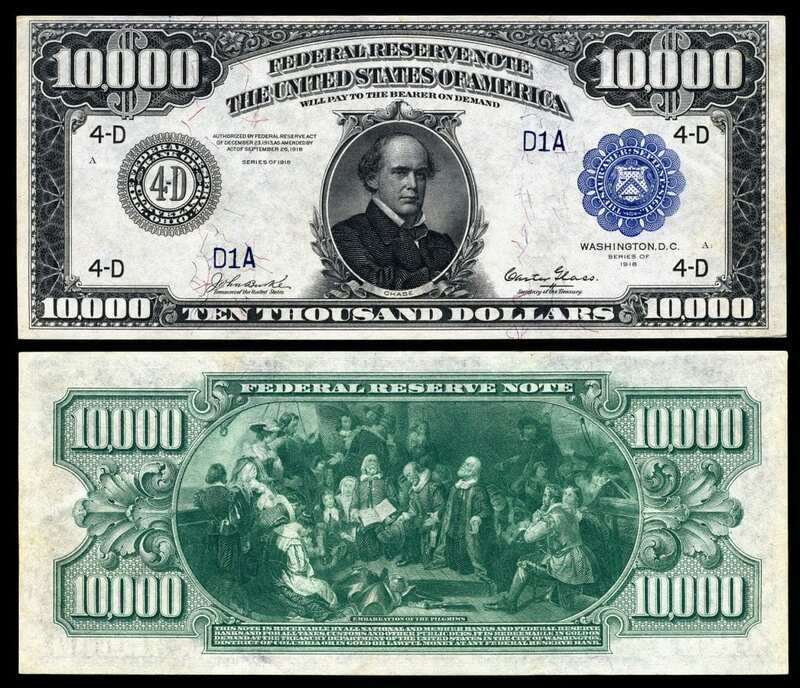 Salmon P. Chase is on the $10,000 dollar bill series. Did you know there exists a $500 dollar bill, a $1,000 dollar bill, a $5,000 dollar bill, and even a $100,000 dollar bill?